GOLDEN, Colo. – Private groups are shaping business plans to tap into the resource-rich environs of outer space. Early celestial targets with commercial cross hairs on them are the moon, as well as asteroids. While the financial backing, technology and entrepreneurial spirit to mine asteroids and other space targets is jelling, yet to be grappled with is a mix of thorny issues, such as property and mineral rights, ownership and possession, international treaties, as well as the big "C" — not for Cosmos, but for Capitalism. What route to mine space? "My lay take on space property and mineral rights is that there seem to be several potential routes that the evolution of such law could take," said Leslie Gertsch, deputy director of the Rock Mechanics & Explosives Research Center at the Missouri University of Science and Technology. "The form that space law will finally take will depend on who has the guts and funds to start the process, what case it’s started with, where it is adjudicated — be it the U.S, Australia, Europe or Asia, for example — and how the lawyers chose to argue their respective points during its course," Gertsch said. "When a major legal firm begins fully billed work, then I will sit up and take notice." Even this may happen several times, simultaneously or sequentially, Gertsch added, before legislation or treaties have become robust enough that businesses feel confident. "But that may not be in the near future," she said. When someone has prospected enough asteroid targets to start detailed mineral exploration, or someone else has characterized lunar deposits worth mining, maybe two to five years from now, Gertsch said, "then we will start to see activity by lawmakers and in the courts." On the frontlines of what next for space resource development is Gregory Nemitz, CEO of Orbital Development in Twin Falls, Idaho. 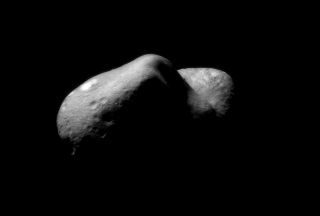 It was Nemitz who sued NASA and the U.S. government over his property rights to asteroid433 Eros, a claim he made about 11 months before NASA landed its NEAR Shoemaker spacecraft on the space rock in February 2001. Pit stop, the moon! Lunar extraction of minerals and ice are envisioned as near-term objectives for space mining advocates. The claim was based in the first tenth of property law, which is ownership before actual possession. Centuries of law, Nemitz said, recognizes that a common law claim to something can be valid prior to possession. The first goal failed, Nemitz said. The federal court and the appeals court declined to examine the Nemitz claim for Eros and granted the state’s motion to dismiss on a technicality, "dismissed as a matter of law for lack of a cognizable legal theory." The issue of just how someone can make an officially recognizable claim on asteroids or other space resources was not adjudicated. The second goal was a success. In the last decade many aerospace-themed conferences have included space property rights as part of their discussions, Nemitz said. In the coming years, it's reasonable, normal and perfectly sound to make claims in space, Nemitz said. For an asteroid, plant a claim marker on the object, say, with a radio beacon. On the other hand, don’t go to the moon and claim the whole moon, perhaps just a 50,000-acre slice, something that is economically viable in size, he said. If you do that, eventually a regime of property rights will be invented, will be adopted, and probably grandfathered in within previous claims…because it will be the people that have those claims that will be clamoring to make a regime for property rights," Nemitz said. "Law follows the actions of people, it does not lead," he added. The focus today should center on achieving human-tended space resource extraction projects and let the law be developed to follow that lead, Nemitz said. Those persons, who arrive to the off-Earth places containing resources, will be the society that will someday define and establish the laws for protecting off-Earth property rights. "Today it is probably best to just carry forward with the engineering projects aiming to extract and use space resources and not worry too much about property rights," Nemitz said. "Property rights are officially recognized primarily to protect property from theft and vandalism. Space is vast and there aren’t any neighbors vying to steal your property, so don't worry too much about it." Nemitz said that there's need to embrace the old Zen rubric: "It is easier to receive forgiveness than permission." More discussion on mining claims contrasted to surface rights should be part of the dialogue, said Dale Boucher, director of innovation at the Northern Centre for Advanced Technology (NORCAT) Inc. in Sudbury, Ontario. It is incumbent on governments to get together and create the regime in which space resource mining can take place, to enable economic activity, he added. Lunar ice maker, just right for mining. Elevation (left) and shaded relief (right) image of Shackleton, a 21-km-diameter (12.5-mile-diameter) permanently shadowed crater adjacent to the lunar south pole. NASA’s Lunar Reconnaissance Orbiter spacecraft has returned data that indicate ice may make up as much as 22 percent of the surface material in the crater. "I don't think a big mining industry is really going to get involved unless that have some surety that they can make a profit," Boucher said. "They can't make a profit from it unless there is some regulatory regime in place that allows them do that … whether that's tax incentives or whether it’s a mining claim concept," he said. In terms of the United Nations playing a role, that organization requires consensus. "I don't see anything happening with consensus," Boucher said. "Maybe it really is going to be, let’s go out and do it and beg forgiveness instead of permission." In many ways, it’s the classic causality dilemma of the chicken or the egg, Boucher noted. He’s not sure which is going to come first: the regulatory framework or the actual economic activity. "But I think we’re on the cusp of both of those happening," Boucher said. Unfortunately or fortunately, depending on a person’s point of view, Boucher said, he’s sure that the legal minds will get involved. "I'm suggesting that maybe we need to dig a little deeper. No pun intended."